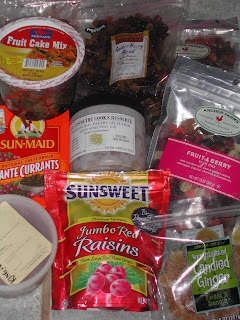 I am always on the lookout for various blends of dried fruits. I am one of those people who feel fruitcake has gotten a bad wrap over time, largely because people see it as a utilitarian kind of cake and as a chore. No one thinks, "Hey, I think I'll make a nice fruit cake for my family." Instead it has become something one gives away and frankly most people don't want them. I get a lot of books and magazines from England. My friend, Sandra, and I joke about the way English cakes seem to all be the same recipe, a recipe for a fruitcake! In England, however, one can find lovely bags of mixed, dried fruit throughout the year. The fruit is supple and tender and actually looks like it might have come from fresh fruit in the recent past. Here's a recipe that might change your mind about fruitcake. I was in Trader Joe's recently, and they had a wonderful blend of dried fruit called "Super Cranberry & Pomegranate Blend." 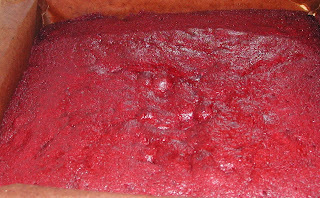 In addition to the titled fruit, the package contained raspberries, cherries and black currents. This recipe works best with some sort of "red" fruit blend. If you don't have a Trader Joe's, try your own blend of cranberries, red raisins, currants, or cherries. The pomegranate seeds were just that, seeds -- so occasionally there was a hard center from the arils. 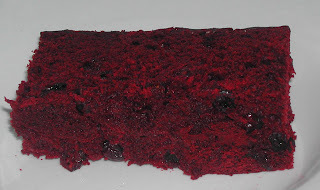 The package of red fruit made me want to add it to a red cake, and what better red cake than a velvet. I modified my recipe to make a fruit cake. Add salt to flour and the vanilla to the buttermilk, then alternate flour/salt mixture and vanilla with buttermilk to the batter, beating well after each addition. Fold in the vinegar mixture to the batter, then fold in the dredged fruit. Pour into a prepared Lucinda’s Wood Cake Box and bake at 300 for 90 minutes. This is a fruitcake you won't want to give to anyone, unless you bake two!